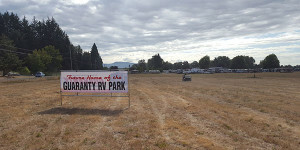 Shannon Nill’s vision of a “true RV destination” is close to fulfillment as Guaranty RV Sales moves into the final stages of a $7 million expansion project that will effectively beef up service operations while adding a 55-site, eight-acre RV park on the dealer’s sprawling Junction City, Ore., campus. Offering full hookups and pull-through capability on 90% of the RV park’s sites, Nill is envisioning a multi-use facility that will be “split about 50-50” between customers needing service and those seeking a relaxing destination camping site. Nill pointed to Winnebago Industries Inc.’s decision in December 2015 to launch a facility for diesel motorhome production in Junction City as an additional catalyst for building the park. 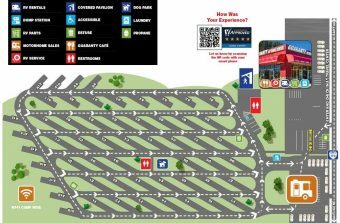 While the RV park may stand as the most prominent piece in the expansion, Guaranty RV will also be extending its longtime focus on service with two new facilities – representing another $5 million investment – that will house operations for the dealership’s RV business while also expanding repair capacity on the auto side. Nill said the paint facility is designed to accommodate today’s larger motorhomes, including models equipped with full-wall slides that are becoming a more prominent feature with OEMs. “We have a full paint shop now, but we simply outgrew the facility with all the larger coaches,” Nill said. “The new facility will have two mixing booths and two limited spray booths, along with state-of-the-art ventilation including a downdraft system. Nill anticipates that growth will continue as the industry saw a landmark performance in 2016, including a 40-year high in shipments. “I think the industry is poised for a pretty good run,” he said. “For us, 2015 was a little better than last year, probably because of the election year drama which caused some people to wait on sidelines. But the economy is still moving forward and we’re seeing a lot of new people coming into the RV lifestyle.